Janine Jansen at Carnegie Hall without veneer – or microphones breathing down her neck. Janine Jansen, Alexander Gavrylyuk and Torleif Thedeen bow after plahing Rachmaninoff’s youthful but ambitious Trio elegiaque No. 2 at Carnegie’s Zankel Hall. What price freedom? Carnegie Hall’s Perspectives series allows its selected artist-curators to have something close to carte blanche over multiple concerts in numerous different forums. This year, the glamorous Dutch violinist Janine Jansen is one of those artists, and later in the season, she’ll be joined by the Philadelphia Orchestra in a performance of the esteemed but little-known Violin Concerto of Michel van der Aa. 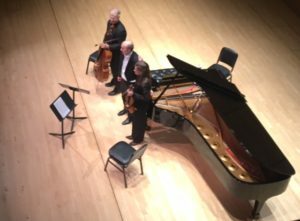 She played a chamber music program of early piano trios by Shostakovich and Rachmaninoff on Saturday at Zankel Hall – with pianist Alexander Garvylyuk and cellist Torleif Thedéen – that might not be encouraged by typical chamber music presenters. Even the program notes mentioned, repeatedly, what not to expect from Shostakovich’s student work, his Piano Trio No. 1 Op. 8. The Rachmaninoff Trio élégiaque No. 2 Op. 9 is played less often than Trio élégiaque No. 1 – which isn’t exactly standard repertoire. Having purchased my ticket, I began the concert with buyer’s remorse. Couldn’t there be one old favorite on the program? Say, the Tchaikovsky Piano Trio Op. 50 that inspired some of the music here? Well, Tchaikovsky wouldn’t have sounded like an old favorite amid the intense, in-the-moment playing of Jansen and friends. I felt like I had been to a concert that had been minted for this occasion only. It had no apparent extra-musical strategy behind it. There weren’t even microphones there. And I wonder if that was a liberating factor in a performance that showed sides of Jansen I hadn’t encountered, and made me want to hear Garvylyuk and Thedéen in any possible future occasion. This was not polite chamber music making, or even with the pretensions of politeness. This was three soloists having at the music with 110 percent commitment and somehow triumphing over any potential balance issues, even with Garvyluyuk playing with the piano lid open – full stick – and behaving, at times, as though he was playing a concerto. Jansen’s customary silky tone and natural lyrical poetry were there, but along with so much else, such as the freedom to make an unpleasant but expressively appropriate sound. The program’s third piece was Prokofiev’s Violin Sonata No. 2 is a transcription of a flute sonata. Her performance suggested it was always meant to be played by violin, if no other reason than the incisiveness and range of violin attacks brought out so many details as to raise the stature of the work. Early works by major composers are often thought of as less-evolved, mainly of interest for what they led to, or showing roads not taken later on (and maybe for good reason). The Shostakovich and Rachmaninoff trios turned out to be sound programming – especially heard together, because as different as they are, they share an unmediated candor. The 15-minute Shostakovich trio similarly assumed greater importance; it seemed so much longer than it really was – in the best sense. And, of course, the 50-minute Rachmaninoff seemed to have grander ambitions than the composer’s piano concertos. It has been increasingly observed that Shostakovich’s early works were influenced by his long hours accompanying silent movies on piano in chilly Russian cinema houses. The Op. 8 trio certainly supports that theory. The single-movement is packed with tightly organized episodes, full of abrupt cinematic cross cutting, and very much attuned to that medium’s way of story telling, jumping back and forth between subplots. Shostakovich was a strong-minded 17-year-old when he wrote the piece, responding to professorial recommendations for revisions with a refusal that was typical later in life. (He would say something like, “Yes, yes, you’re right but I will fix it in the next piece.”) The trio’s individual episodes often have the manic energy of silent-movie comedy. But the piece also holds up as pure music – as opposed to something that can be interpreted according to the composer’s environment at that time. The Rachmaninoff trio was composed when the composer was 20; he started working on it on the day of Tchaikovsky’s death in 1893. For all of its intense emotionalism and compelling effects, the piece doesn’t always sustain its own grand design. But the audacity of it all, the determination to write something even if it wasn’t a sensible thing for him to do at that stage in his creative evolution, is in itself attractive, especially in such a thoroughly investigated performance as this. All three performances felt epic. I didn’t want to hear any more music until the following day. Well written! Wish I’d been there! Good to see you in blogging action here. Of course, in NYC, one has to pick and choose carefully in order to remain reasonably within budget. Still haven’t seen JJ live, as the one time that I’d hoped to see her in concert in NYC, with the Budapest Festival Orchestra and Ivan Fischer, JJ called in sick. (Liza Ferschtman took her place, and did so very well.) Maybe WQXR could recruit you for its ‘Carnegie Hall Live’ presentations at some point. Thanks…I’m so glad I was there. I’m adjusting to life NOT being on staff at the Philadelphia Inquirer. It’s interesting going to things I want to hear, as opposed to things I am obliged to hear….